Due to increasing focus on preserving user privacy and security, PC login has been made indispensable on Windows 10 by Microsoft. So every time you start PC, login screen will show up before you can use the OS. Therefore, embellishing login screen background with cool images and wallpapers only makes sense since it is the screen you will always encounter when switching on Windows 10 PC. However, there is not any straight forward method provided by Microsoft to change login screen background like the way you can do with lock screen from settings menu. In this post, we will present some tricks using which you can change Windows 10 login screen background image on desktops and laptops. When you hit any key or press enter on lock screen, Windows 10 takes you to the login screen where you enter PC password. Changing login screen background isn’t an option on Windows 10 unless you make some make some changes to system registry files manually. Press Win+R keys to open Run command dialog box. Rename DWORD value DisableLogonBackgroundImage and open it by double clicking DWORD icon just created. Now under ‘Value Data’ box change the value to 1 and click OK button. Close registry hack window and restart the PC or press Win+L keys to see new one colored login screen. This background color will be determined by your PC desktop theme color. However, you can change it to the one of your liking. Default new login screen color that you created by following the method above will be the same as the accent color of your desktops theme. In order to make changes to it, go to Start > Settings > Personalization > Colors and switch the option named ‘automatically pick an accent color from my background’ to OFF. Now a box containing default Windows desktop background colors will appear but options are limited. Next in show color mixer option select the color of your liking and hit OK button. Apart from login screen background color, this color will also replace existing desktops tiles and interface color. With the method above you changed login screen background to a simple one colored background window without any image. But what if you want to set a different image to the one set by Microsoft by default on login screen? Well, there is no registry hack or settings menu option available for it as of yet. Some users have come up with an alternate way of setting custom login screen images, which includes changing image in PRI file saved in ‘Windows.UI.Logon.pri’ file. NOTE: This method includes third-party package, so continue at your own discretion. 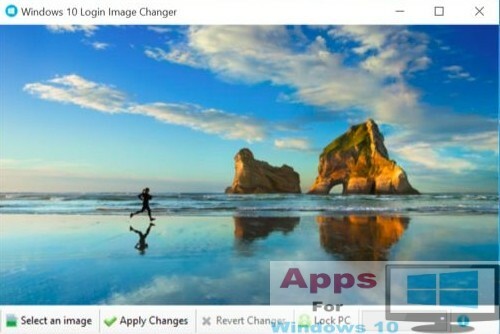 Click on Windows 10 Login Image Changer created by Alphawaves developer. Login to register in order to be able to download the file from direct download link. Run the downloaded file and follow on-screen instructions to select custom wallpaper from the location where it is saved on your PC. You can also use wallpapers downloaded from the internet. All the above mentioned methods work on latest Windows 10 builds but could change in future depending on Microsoft decision to alter the workings of registry hack option. Or maybe Microsoft might release easier default login screen image settings options within Windows 10 settings menu or control panel to help change login screen background as a replacement for third-party tools or hack methods. Also Check Out: Face Swap Live for PC Windows 10 & Mac & Facebook Lite for PC Windows 10 & Mac.